Please help us in this work with your donation. Contribute to the fund for the purpose of stopping the misuse of this technology beyond the coverage of current laws. Money donated to the fund will be kept in an individual account for the purpose of introducing legislation designed to restrain the illegal use of drones. 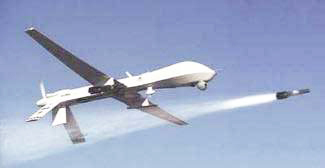 Predator Drone Shooting Hellfire Missile. June 15, 2011 "Information Clearing House" -- Defense contractor giants like Boeing, Lockeed Martin, Northrop Grumman, and others, as well as smaller rivals compete for growing demand for unmanned aerial vehicles (UAVs). They include remote control operated killer drones, also called unmanned combat aerial vehicles (UCAVs). It's America's newest sport. From distant command centers, far from target sights, sounds, and smells, operators dismissively ignore human carnage showing up as computer screen blips little different from video game images. The difference, of course, is people die, mostly noncombatants. More on that below. They "sit in air-conditioned rooms far away from (America's wars). They guide their weapons with joysticks and monitors. The remote warriors work with a high degree of precision - at a fraction of the cost of a fighter jet," but just as deadly. Operators use computer keyboards and five monitors. One says "I've got eight missiles and two bombs on two Predators. Weapons ready." The main monitor shows a target's aerial view "from a considerable height....Three, two, one. Impact," after pushing a red button. "Excellent job," the man says after a destructive explosion. The entire mission lasted two minutes "against a faceless enemy" attacked by remote control half a world away. "The whole thing looks like a computer game," virtual war "that doesn't require combatants to get their hands dirty" or perhaps souls compromised for mindlessly slaughtering civilians lawlessly - what America's media never explain or why Washington wages war. Each drone system includes four aircraft, a ground station, a satellite link, and launch site maintenance crew, keeping UAVs ready to use round-the-clock on a moment's notice. Like America's wars, moreover, drone technology is a growth business, Insitu's Steven Sliwa saying the industry is well positioned like the aeronautical one during WW II - up-up-and-away for big profits. Two currently operate, the CIA's at its Langley, VA headquarters, the Pentagon's at Nevada's Creech Air Force Base, about 35 miles from Las Vegas. Look-alikes, they're sterile, insular, secure computer rooms manned by "combat commuters." By day, they wage war, then drive home for dinner, relaxation, and family time, dismissive of killing for a living like mafia hit men, except they do it daily on a global scale against nameless, faceless targets. The Pentagon's team maintains constant radio contact with its Combined Air Operations Center (CAOC) Qatar headquarters and US Kandahar, Afghanistan base where UAVs take off and land. Sanitized killing on the cheap leaves disturbing issues unanswered, including a program shrouded in secrecy, no accountability, and dubious "no reports" of civilian casualties despite "credible (ones) that hundreds of innocents have died." International law, in fact, demands accountability. "When complete secrecy prevails, it is negated. Secrecy also provides incentives to push the margins in problematic ways....Equally discomforting is the 'PlayStation mentality' that surrounds drone killings. Young military (recruits, CIA operatives, and private civilian contractor) personnel raised on a diet of video games now kill real people remotely using joysticks." Counterinsurgency advisor David Kilcullen "told lawmakers last week that drone strikes" successfully hit militants 2% of the time. All others are noncombatant civilians. These casualties then "become an extension of war by other means. Tactics that physically defeat elements of the enemy and lose the population lose the war," besides issues of legality. In his book "Wired for War," Peter Singer called drone technology disturbingly "seductive" because it makes combat look "costless." Britain's former Iraq air chief marshal said it was "virtueless war," requiring no heroics or getting one's hands dirty. According to Law Professor Mary Dudziak, "Drones are a technological step that further isolates the American people from military action, undermining political checks on....endless war," as well as its fallout, including the human cost, and America's illegal targeted assassination program. "The number of platforms in this category - RQ-4 Global Hawk-class, MQ-9 Reaper, and MQ-1 Predator-class unnammed aircraft systems - will grow from approximately 340 in (FY) 2012 to approximately 650 in FY 2021." The Army's got a Gray Eagle Reaper-like drone. The Marines want a similar one as part of their Group 4 Unmanned Air System program. The Navy's so-called Unmanned Carrier-Launched Airborne Strike and Surveillance initiative aims to put jet-powered killer drones on carrier decks no later than 2018. Around the same time, the Air Force may start buying jet-powered ones to complement its prop-driven Reaper. By decade's end, it hopes to have enough medium and large drones to maintain at least 65 round-the-clock "orbits" compared to now. Combined with other service branches, 100 or more permanently positioned killer drones may launch precision-guided bombs and missiles on targets virtually anywhere. Moreover, improved sensors like the Air Force's Gorgon Stare and new foliage-penetrating radars will let new generations of drones do what multiple ones are needed for now. Given the profit potential, US defense contractors are scrambling for part of a bigger pie, developing new killer drone models, including Boeing's X-45C, Northrop Grumman's X-47B and General Atomic's Avenger. Others will follow to satisfy the Pentagon's insatiable appetite for remote killing and destruction on a global scale. If America's military had a motto, it would be war is good, the more the better. How else can generals get stars? "demanding that the government disclose the legal basis for its use of unmanned drones to conduct targeted killings overseas. In particular, the lawsuit asks for information on when, where and against whom drone strikes can be authorized, the number and rate of civilian casualties and the other basis information essential for assessing the wisdom and legality of using armed drones to conduct targeted killings." The ACLU sued the Defense, State, and Justice Departments after each provided no requested information "nor have they given any reason for withholding documents. The CIA answered the ACLU's request by refusing to confirm or deny the existence of any relevant documents." CIA wasn't sued because the ACLU appealed its non-response to the Agency Release Panel. Others were deployed in Bosnia in 1995 and against Serbia in 1999. America's new weapon of choice is now commonplace in Iraq, Pakistan, Afghanistan, Libya, Yemen, Somalia, and domestically, including for law enforcement - in fact, virtually anywhere for targeted attacks and/or surveillance globally. At issue is their legality, given their use outside traditional battlefields for extrajudicial assassinations, a practice US and international laws prohibit. Yet reports confirm Obama's ramped up use with long-term grander schemes - why the ACLU and other human rights groups express concern. "First drones launch missiles or drop bombs, the kind of weapons that may only be used lawfully in an armed conflict. Until the spring of 2009, there was no armed conflict (in Pakistan). International law does not recognize the right to kill without warning outside an actual armed conflict. Killing without warning is only tolerated during the hostilities of an armed conflict, and, then, only lawful combatants may lawfully carry" them out. CIA members "are not lawful combatants and their participation in killing persons - even in an armed conflict - is a crime." US military forces may be "lawful combatants in Pakistan" only if its government officially requested them. It did not. Further, beyond targeted individuals, collateral killing is commonplace. "Drones have rarely, if ever, killed just the intended target. By October 2009, the ratio has been up to" 50 civilians for each militant. As a result, drone use violates "the war-fighting principles of distinction, necessity, proportionality and humanity." Nonetheless, violations continue daily in Iraq, Afghanistan, Pakistan, and now Libya, having escalated dramatically in recent years. Along with bombers and helicopter gunships, their use in Afghanistan (and North Waziristan, Pakistan) is so pervasive that anyone in the open or near targeted sites risks death - civilians, including vulnerable women and children for being in the wrong place at the wrong time. On March 13, 2010, Der Spiegel headlined, "Drones Are Lynchpin of Obama's War on Terror," calling them his weapon of choice. "But the political, military and moral consequences are incalculable." One report said in the past two years the Air Force Research Laboratory embarked on a program to "build the ultimate assassination robot (described as) a tiny, armed drone for the US special forces to employ in terminating 'high-value targets' " that most often are noncombatants. On April 4, 2010, New York Times writers Jane Perlez and Pir Zubair Shah headlined, "Drones Batter Qaeda and Allies Within (North Waziristan) Pakistan," referring to a "stepped-up campaign....over the past three months (casting) a pall of fear over an area (by) fly(ing) overhead sometimes four at a time, emitting a beelike hum virtually 24 hours a day, observing and tracking targets, then unleashing missiles on their quarry...."
The ferocity of strikes, in fact, got one Pakistani to say, "It seems they really want to kill everyone....," civilians, of course, most vulnerable. Almost daily, noncombatant casualties are reported, sparking public anger and protests, including over America's regional presence. "What they will bring that is unique to the conflict is their ability to get down lower, therefore to be able to get better visibility on....targets now that they have started to dig themselves into defensive positions." World outrage is also growing, including from the Pan Afrikanist Steering Committee of Namibia against The United Nations Resolution 1973 (PSCNAUNR), calling NATO's Libya war "a desecration of the Afrikan homeland by a set of Europeans." Saying it's an "appalling atrocity," Western supported "mercenaries" are being used "to kill, maim, destroy local infrastructures, and attack Afrikans....living in fear of their lives within Libya." NATO, "under the guise of the UN, deliberately started its bombardment under a hidden agenda for Regime Change" in violation of international law. "It is now crystal clear that the motive behind Resolution 1973 was of a sinister nature, (effectively) representing a Declaration of War" against a nonbelligerent state. June 12 on the Progressive Radio News Hour, Cynthia McKinney reported from Tripoli, saying hospitals, schools, residential houses, and other non-military sites have been bombed, causing numerous civilian casualties. NATO and America's media duplicitously deny it. "The United States strongly condemns the Syrian government's outrageous use of violence...particularly in the northwestern region. There must be an immediate end to the brutality and violence. We regret the loss of life and extend our condolences to all those who have suffered." The double standard gross hypocrisy requires no comment, especially in light of the Washington, Israel, Saudi, and Lebanon's March 14 Alliance project to destabilize Assad's government, including by inciting and supporting armed militants for regime change. So far, Russia and China have blocked a proposed Security Council resolution condemning Syrian violence, fearing passage perhaps means more war. It's America's favored strategy against regimes it doesn't control. "By following the path of (Gaddafi) and deploying military forces to crush peaceful demonstrations, al-Assad and those loyal to him have lost the legitimacy to remain in power in Syria. We urge President Obama to state unequivocally (that it's) time for (him) to go," stopping short of calling for war they may join with others in demanding it. Stephen Lendman lives in Chicago and can be reached at lendmanstephen [at] sbcglobal.net.